The Dance Hall ("Rec Hall") is a wood and stone 1930's structure with a great, very smooth 45' X 60' floor over joists; a big stage at one end, big stone fireplace at the other; lots of windows and 4 sets of very wide double doors to keep the hall comfortable. Probably the most well-ventilated hall you've ever danced in! Convenient rest rooms right off the dance area. Cozily but not at all crowded, the hall will hold 170 dancers. Just down the hill from the Rec Hall, the Dining Hall is another spacious wood/stone 1930's structure with a (functional!) large stone fireplace which we'll light in the evening if requested. Even if you bring your own food, please come eat it here if you like. The Dining Hall is also a nice place to jam and sing anytime: piano available, musicians very welcome! This is a RUSTIC facility owned and operated by Fayette County, WV, which has limited resources. Those camping or staying in cabins need to form a community to keep their space clean and report problems as they occur. We will use our volunteer resources as best we can to act on problems as they occur! Park opens at 8:00am and closes at 9:00pm. A 10-mph speed limit and one-way traffic designation will be enforced within the park. Trash and garbage is to be disposed of and the area cleaned before leaving. NO beer or intoxicating beverages are allowed on park grounds. NO pets allowed! No cats or dogs. NO off-road vehicles allowed on park grounds. ANY VIOLATION OF THESE RULES WILL RESULT IN DISMISSAL FROM THE PARK. Summer hours are from 8:00 am to 9:00 pm. The park is owned and operated by the Fayette County Commissioners. Fayette County Park is about five miles west of Fayetteville, WV, near Beckwith, WV. The Fayette County Park's origin lies in a land grant from 1925 for 30 acres of land from Loup Creek Collieries, Inc. This grant was originally given to the Fayette County 4-H Club for a camp. During that summer the mess hall, kitchen, and well were constructed. From the beginning development of the park rested upon the shoulders of many donors who eventually turned a dream into a reality. 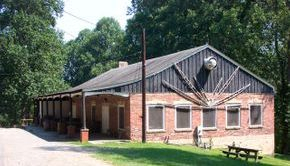 By 1934 the camp property consisted of not only the mess hall, kitchen, and well but also a three room caretaker's house nine cabins, a partially completed playing field, a shallow well with hand pump and a Delco LIght Plant. By 1936 a 40 x 60 recreation hall, three swimming pools, and a bathhouse had been added. In 1954 ownership of the park was passed into the hands of the Fayette County Commission from the original owners.